Main principles of creating the MAKS-D Experimental System - Demonstrator of technologies of the Aerospace Systems are considered. The MAKS-D Demonstrator consists of the AN-225 Carrier-Plane and Sub-orbital Rocket Powered Plane having the same airframe as the MAKS-OS Orbital Plane. It is intended for the flight tests of the elements of the full-scale Aerospace System. The MAKS-D Demonstrator will have additional application for injection into the Earth orbit of small commercial payloads using rocket stage as well as for tests of the advanced ramjet and scramjet engines. Many countries with the advanced aerospace industries have declared lately that it is necessary to develop in advance relatively cheap experimental flight demonstrator and performing all needed flight tests on it to work out the most complex technologies for successful creation of new reusable space transport system (RSTS). In this case the technological risks for creation of full-scale RSTS is decreased and also it is possible to distribute all financial expenditures evenly in time. The USA, the countries of European Community and Japan showed great interest for creation of the demonstrator for the future RSTS technologies. Among all versions of demonstrator projects, the variants are used not only for flight test, but also for injection into the Earth orbit small commercial payloads at low launching cost, are especially notable. Such strategy allows returning part of the financing spent on demonstrator creation. Financing of the works may be with involving the private capital. test flights of experimental plane are carried out along sub-orbital trajectory. in the form of the basic full-size OP construction of the main MAKS version with the fuel tanks located in the payload bay. The second version with build-in fuel tanks needs less expenditure for creation, as the aerodynamic researches on the MAKS orbiter were almost completely conducted. This demonstrator modification was intended to be equipped with the main propulsion unit of the experimental plane consisted of one RD-120 oxygen-kerosene engine produced by NPO ENERGOMASH and two NM-7V oxygen-hydrogen engines produced in the West Europe. The development of experimental aerospace system was carried out in the frame of ORYEL study, financed by the Russian Space Agency. 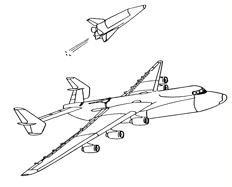 Similar research was done in the frame of technical proposal on the MAKS-D demonstrator with the An-225 carrier-plane and sub-orbital experimental plane on the basis of the MAKS orbiter aerodynamic configuration and construction (Figure 1). Unlike RADEM demonstrator, the MAKS-D main propulsion unit consists only of one RD-120 oxygen-kerosene engine. It simplifies the project and reduces its creation cost. Using only kerosene as fuel in condition on fixed volume of the EP tanks increases energy resources in comparison with a variant where hydrogen and kerosene fuel is used. Being the prototype of a full-scale launch system, MAKS-D provides additional application as a flight laboratory for testing advanced ramjet. MAKS-D can be also used as a reusable booster stage for small payloads’ injection into an orbit. The cost reduction of the MAKS system by means of the advanced development cheaper experimental system is one of the ways to use subsonic plane as launching platform for injection into an orbit. In the limited financing of space industry the creation of the MAKS-D demonstrator as a first step will help to start the full size MAKS creation. That’s why the MAKS-D project supposes maximum usage of construction and technological studies resulted from the demonstrator for further creation of the MAKS system. The An-225 existing plane used as carrier was designed for transportation of the ENERGIA-BURAN system’s elements. This airplane should be equipped with on-board launching complex, which provides fastening of the EP to carrier-planes, testing the on-board system of the experimental plane, preparation before launching and experimental plane start. The MAKS-D experimental plane has the basic construction similar to the construction of unmanned MAKS orbiter (Figure 2). The wide unification of the MAKS-D experimental plane and MAKS orbiter on-board systems is supposed. The take-off mass of the experimental plane is approximately 58 tons (fuel mass is about 45 tons). During the flight test program for working out the elements of MAKS system the experimental plane is able to achieve 85…90 km altitude and Mach number up to 15. When the main fuel is off, the experimental plane performs a controlled descend and automatic landing on the basing airdrome. The range of the autonomous flight of the experimental plane is up to 1500 km. The ground-based complex consists of the basing airdrome, ground service complex and ground filling complex. The equipment of the MAKS-D ground-based complex corresponds to the analogue ground equipment of the MAKS system. The ground control complex of the MAKS-D demonstrator provides the fulfillment of the flight program, including the most intensive flight legs of the MAKS system. The layout scheme and flight performance of the experimental plane gives an ability to install experimental modules of the air-breathers under the fuselage and to fulfil the flights with a velocity and at altitude which can’t be simulated on the ground at present. In this case the test works for scramjets, ramjets and other engines with a full-scale air inlets, combustion chambers and part of nozzle for the advanced hypersonic planes and reusable aerospace transport systems are ensured. For these purposes it is supposed to use the same flying vehicle, that was previously used as a technology demonstrator for future space transport systems. To ensure the second step the experimental plane is equipped with the experimental modules of the air-breathing engine, the nose cowling is exchanged, the additional hydrogen fuel tank for the air-breather is installed and several control flight algorithms are polished up (Figure 3) . The conception of the MAKS-D experimental system foresees its usage for injection small payloads with a weight up to 2 tons into an orbit. For that purpose the system is supplemented with the additional rocket stage (RS) where the payload is located. The different versions of the rocket stage on the basis of the existing and developed ‘oxygen-hydrogen’ and ‘oxygen-kerosene’ boost modules are considered. Two versions of the rocket stage layout and the MAKS-D booster are worked out in details. tandem scheme with the rocket stage located in the payload bay of the experimental plane. The sub-orbital experimental plane in the MAKS-D transport versions is used as a reusable booster of launch system. Its RD-120 engine starts during the flight on the carrier- plane before separation. When the main fuel from tanks of the experimental plane is off, the rocket stage separates from EP. Then the rocket stage continues its autonomous flight along the injection trajectory into given orbit while the sub-orbital accelerating plane fulfils guided descent on the landing airdrome. In the case of packet scheme (Figure 4) the main propulsion unit of the rocket stage starts in five seconds after EP separation from carrier-plane and works simultaneously with the RD-120 engine of the booster (the parallel mode of the main propulsion unit). The tandem scheme (Figure 5) is similar to the X-34 famous American project of the demonstrator. Here, the propulsion unit of the rocket stage starts after the separation of the sub-orbital accelerating plane (the consecutive mode of the main propulsion unit). The major advantage of this scheme is a higher level of lift-to-drag ratio, as well as reduced losses due to the aerodynamic drag at launch trajectory. The tandem scheme excludes payload cowling as during the flight through the atmosphere dense layers the rocket stage is placed inside of the payload bay of the accelerating plane. According to the preliminary valuation the cost of injection into an orbit with use of the MAKS-D system’s transport version is considerably less than cost of other existing system presented on the market. Thus, the commercial application of the MAKS-D system can guarantee the project self-repayment as well as further profits. Realization of the MAKS-D experimental system can guarantee the solutions of many scientific and technical problems in the field of high-speed aviation and reusable aerospace transport systems. If it is used in commercial projects for injection of small payloads into an orbit, it will be self-repaid. It also helps to decrease the total amount of expenditures required for creation of full-scale MAKS system since many constructional and technological problems would be already solved.